Meek Mill is a rapper from Philadelphia and has recently been signed to Rick Ross' Maybach Music Group. Mill was born in North Philadelphia but spent a lot of time in South Philadelphia. In 2007, Meek debuted his Flamerz series, which stands for hottest songs and released his first mixtape, Flamerz, which featured the hit single, "In My Bag". In 2008, Meek debuted Flamerz 2 –"Hottest In The City"', which showcased more of his lyrical abilities with the singles, "I'm So Fly", "Prolli" and "Hottest In The City". Upon release of Flamerz 2, it caught the attention of founder and President of 215-Aphillyated Records, Charlie Mack. Mack was immediately impressed with Meek that he signed him to his management company. During the same year, he met the founder and owner of Grand Hustle Records, T.I. T.I. was impressed with his lyrical ability that he offered him an opportunity to travel to Los Angeles to meet with him along with the Warner Bros. Records, within one week both record companies offered him a deal. Meek was overwhelmed by the offers; however, he felt collaborating with T.I. was an opportunity of a lifetime and chose his label. 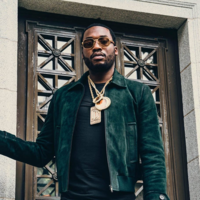 An ecstatic Meek was on top of the world; a record deal and the chance to work with one of hip hop’s greatest rappers and then a setback occurred. He was arrested, charged with a crime and order to serve seven months in jail. Meek pre-released three singles from his third mix tape Flamerz 2.5 – "The Preview" in August 2009, which featured the chart topping hits, "Make 'Em Say", "I'm Da Ish" featuring Ms. Jade and "Starting Something", in honor of Michael Jackson. Within the first two weeks of its release, Clear Channel added it to their play list, which is an anomaly in the music business. In June 2009, Meek began immediately working on his mixtape – Flamerz 3, "The Wait Is Over – Gangster Grill Edition", hosted by DJ Drama and featuring the songs: "Im Clean", "Rose Red", and "I’m Killin 'Em". The highly anticipated mixtape was set to be released on January 19, 2010. In the future, Meek plans to establish the Meek Mill Foundation, which will mentor young males between the ages of 12-24 on the importance of "Education over Incarceration." He also plans to collaborate with United Community Action Network and the Lifers of Graterford Prison to address the violence plaguing our cities. In March 2011, Meek Mill was named one of the top "Freshman of 2011" by XXL magazine, where he was awarded the title "Most Street". He appeared on the cover of the April 2011 edition along with fellow 2011 Freshmen, Lil Twist, Cyhi Da Prynce, Big K.R.I.T., Diggy Simmons, Kendrick Lamar, Yelawolf, Fred The Godson, Mac Miller, YG, and Lil B.